With the weather now starting to cool down here in Melbourne, my head is full of thoughts of the Northern Hemisphere, and the warm sunny days that soon await it. This has got me thinking about my recent trip at the end of last year through central Europe, so I’ve been dreamily trawling through the photos. Whilst I was traveling, I found guides that others had created to be immensely helpful.. especially since some of my biggest passions and interests revolve around sustainable living, ethical fashion and vegan food. (Things that aren’t all super mainstream… yet)! So I thought I’d share some of my experiences with you too. On that trip I visited Amsterdam, Berlin, Budapest and Prague, and whilst all were amazing, it was the city of Berlin that absolutely stole my heart. The place has such an incredible energy and culture, and its people are all such thinkers. Perhaps that's why sustainably-minded living, ethical fashion and veganism are all so popular there. 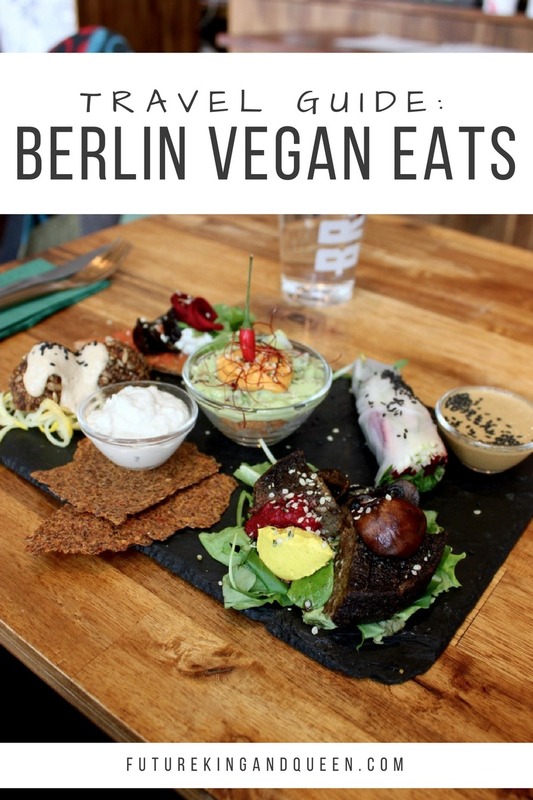 Berlin really is an absolute haven for vegan and vegetarian foodies. No wonder it has a reputation for being the vegan capital of Europe! I found this to be especially true for the area that I stayed in, Friedrichshain, where nearly every second cafe, restaurant or bar seemed to be vegan or vegetarian, or at least had signs advertising vegan options. The eco-friendly and vegetarian hotel I stayed at (Almodovar) turned out to be one of the highlights of my trip. There was even a vegan buffet breakfast..
A feast from the epic vegan breakfast spread at the Almodovar eco hotel Berlin... yes there were vegan croissants! Rawtastic: for incredible & inventive raw plant-based foods. 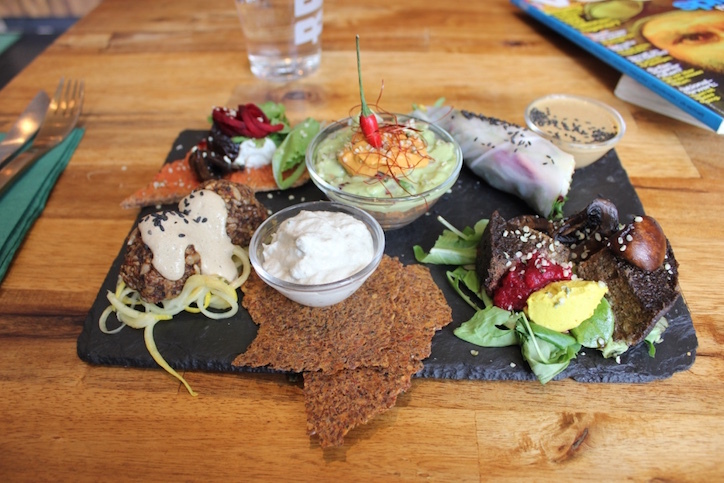 Raw Tasting Plate at Rawtastic featuring raw pizza, tex mex bowl, rainbow rolls, mushroom burger, falafel, flax crackers & cashew cheese. The Bowl: clean eating restaurant, attached to the Friedrichshain branch of Avesu vegan shoe store + Veganz supermarket. Go for a nourishing meal after perusing the huge selection of vegan groceries and fashion pieces. Goodies: for a quick & healthy(ish) lunch or snack. There are 3 branches of this cafe & deli, with 2 of them attached to Veganz supermarket stores. Here you can find a large selection of plant-based wraps, salads, drinks, desserts & baked goods. Veganz supermarket: for all your plant-based grocery needs in one location. As well as fresh fruits & veggies, there's a huge range of vegan snack foods, desserts, non-dairy cheeses, ice-creams, milks & yogurts, mock-meats and more. This Berlin-based chain now has 3 stores in this city, as well as in Prague, Vienna and online. Liquid Garden: for a seriously impressive selection of green smoothies, raw desserts & nourishing soups, using seasonal vegetables, fruits and herbs. The owner here was truly lovely, and the little store had such a cosy and welcoming atmosphere. Emma Pea Vegan Food + Bar: for plant-based street food, in a seriously cool bar district. This place was closed when I visited (it opens in the evening), but the street art around it and the nearby area are absolutely incredible to see, any time of day. Vöner: it's like your local friendly kebab store, only it's entirely vegan! There's even a rotating kebab spit, made from seitan. This place is casual and no-frills, but I was told by several locals that this was one their favourite vegan eateries in Berlin. If you love your comfort food, make sure to add Vöner to your to-try list! I love that even mainstream, side-of-the-road currywurst stalls in Berlin had vegan options. (Check the menu item second from the bottom)! This snap below was taken at a sausage stall out front of a train station. There are still so many more vegan and vegan-friendly eateries that I didn't get a chance to try, but what a great problem to have hey? Have you been to Berlin? How did you find it? Where were your favourite places to eat at? Stay tuned for: Where to Shop Fair, Sustainable & Ethical Fashion in Berlin (post coming soon).